You know what I love about this whole sporty chic thing? Take some comfy shorts and a top, add heels and blazer, et voila, you’re done! Now if I can just get my hands on a pair of fancy scalloped Chloe shorts, my life will be complete. Oh and this nifty little pin thing I found in my mother’s old jewelry. I think it gets along nicely with my blazer. I LOVE the pink blazer – great color! what a lovely color! i like the black accents throughout the outfit–it really pulls it together. oh, yes! i just linked the trailer on that post. this blazer is AWESOME. you pull it off very well- and it's perfect with the pin! Oh that blazer is FAB! I love the color on you! And amen to more Chloe in our lives. I support that! 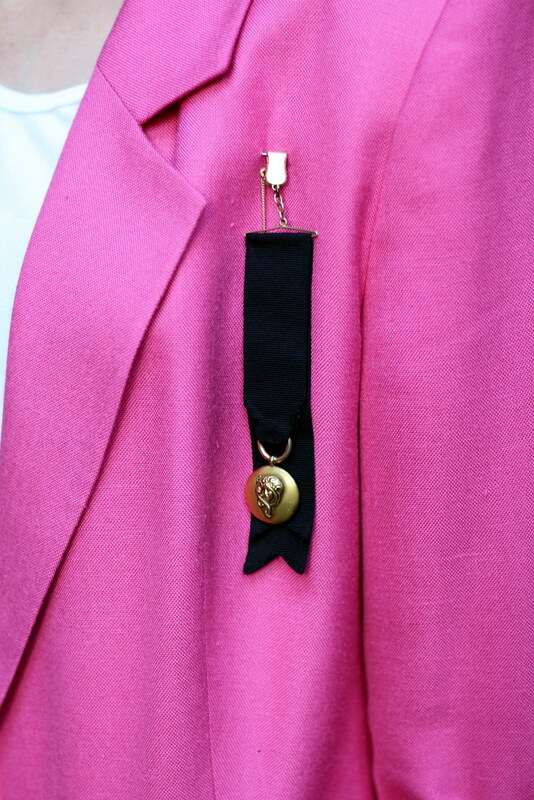 Love the bright pink of the blazer– and the vintage pin adds a nice personalized touch to the look! Oh I can't believe those are Forever21 shoes! NICE. You always have such kind words for me, and I thank you for that. I love the shoes and the blazer. It looks beautiful. x! I agree, that pin is getting along quite nicely with your blazer. 🙂 And I must say, the pairing of country club meets gym meets those ready to walk-all-over-you heels, perfection! That blazer is a lucky and lovely find! The pin adds a cute touch too! chanel! ack, i'm jealous! also, i still can't believe those shoes are f21..seen them around the blogs recently – very cute! Love that blazer, darling! And I can't believe those shoes are f21 ~ so impressive! Those shoes are amazing! I was so surprised that they were from Forever 21! Those shoes are sooo sweet! I love them! omg! what a perfect blazer! and what a stunning shoes! I love the pink jacket. It's such a great bold color. The shoes are so edgy. That pink blazer is AWESOME. I love it. That blazer is very lovely! yer shoes are H.O.T.! just like this weather!!! love the pink and black! …and the shoes! fab! omg, those shoes!!!!! you look totally fab! wow, the colour is so vibrant, it makes the whole outfit:) and great shoes too! You look smashing. That blazer is super sweet! F21, thank you for being so fabulous. ooooh, i love that vintage pin! those shoes are absolutely lovely! I love that pin, too! OMG PINK BLAZER?!?!?! I WANT I WANT I WANT. This outfit is pure gold!! I want the blazer, the shoes, the little pin. Cute! I like your blog, do you want to swap links? great outfit, I love your blazer + pin! love all the straps on those shoes!!!! Love the pin on the blazer n can't believe those shoes r from F21, beautiful! Ahh i love the blazer!! that pin looks great on your blazer! oh my word, I almost died when I saw that pink blazer! It is too wonderful for words!! Those shoes are fantastic, I would have never guessed f21. Since you enjoy self torture and eye candy as much as I do, I did recently shoot the Chloe shorts. Not my style personally, but I can see why girls are fawning over them. Love your look! Really amazing with the pink blazer and those shoes! Pink! love it! Hey I tagged this look on my blog. Thanks!